Note: The snow has arrived, and we are eating chocolate-chip oat cookies and apple crisp. We taught the boys to play hearts, and having fun. I hope you are, too. Blessings to all! Note 2: Unbelievably, I wrote this post yesterday, and I ran out of time to post it before other duties called. Then Michelle Marie wrote her post for me, that I reblogged today, and it’s as if she knew!! She is psychic! Cheers of spring on a deary December day … and I hearts is a great card game! Another great game! … unfortunately, I haven’t played either in years. Children are great card players. They never worry about the hundred other things that need doing. I..Love..Your..Rose..truly, but can someone please tell me where all these little white snowflakes are coming from on so many of the pages I am visiting. Are all you wonderful people conspiring to drive me a little bit bonkers..Lol..or is my laptop in need of replacement..?? Now that I know where it’s coming from, it’s more than welcome to stay. I guess I must have turned it on by mistake. Strange how just knowing makes all the difference. In psychology 101, they teach you that if you are studying, and a noise outside your room is disturbing you, just get up and go identify the sound. As soon as you know what it is, you can go back to studying, and you won’t notice the sound any more. So thanks Brenda. You’re the best. Really beautiful, and exactly: dreams of spring! Thanks, and I wish it were mine, but it’s a neighbor’s. It’s been such a mild fall. I still have herbs in my garden that are edible. It’s unbelievable really. 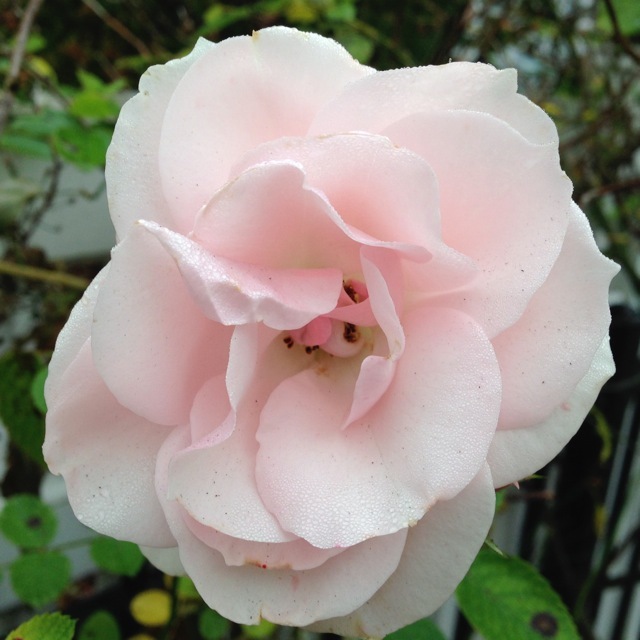 thinkingpink loves November rose from sweet Pink Brenda! Such a delicate delicious pink. Almost want to eat it. Hearts! There’s a game I haven’t played in a while. We have been having fun. We had guests for brunch today, and lots of good food. I love to see my kids playing happily. And I was dreaming of spring flowers, you were so right!! Snow and cold here. It will be a a while before we see beautiful flowers again. Thanks for sharing this one. Thanks! Hope you Thanksgiving was fun! Survived a tough winter but Spring is here and helps feel better. Plenty of Thanks Giving for this but No Celebrations. The only Turkey that suffers in this household is …me! Lol! to enjoy your creations … silently, Lol! but i take each day as it comes..
Hope you are keeping well and enjoying the autumn (?) where you are. Yes, autumn here. Life is stripped bare and showing lovely bones, and the sidewalks are cushioned by all the leaves. I marvel at how the sudden absence of all that fall color can be so devastating, and then it can reveal a subtlety that was hidden. 🙂 I’m glad you made it to spring, and I hope you are surrounded by love and flowers. Brenda, even your description of the change is poetic! I m sure we will see a lot of great autumn inspirations from you and i know you will enjoy its beauties as much. I know! I took the picture right before the snow came. In late November! Hard to believe! Just soft color and touch the heart!